By doverdemon77, September 18, 2013 in Plugins - Publishing ONLY! This is basically a tint plugin, but can be used to get a, uh, different tints of pixels in a stencil. 01. Watch the capitalization with code: Like if you put an "IF", you'll get a weird error in CodeLab about there not being a ";", but really it's just supposed to be an "if"
03. Changes the Saturation of the Primary Color based on those levels. 04. Replaces all pixels with such colors. 05. Keeps transparency/alpha levels the same. So, you basically get a tinted version. Probably could be done some other way (or with other plugins), but I had some time to kick around today anyway. 01. Use red, blue, etc...doesn't work well with black or anything around that. 03. Slider: Saturation Lower Limit can apply less/more tint. 04. Slider: Tint Offset applies more/less tint. Source code is in the zip. Here's version 2. It's completely different, but the same basic idea of making a stencil. 02. This plugin picks up each bitmap square and replaces it with that Primary Color. 03. There's also an Alpha slider so if you want to keep some alpha shading around a graphic, just set it High (255). Some screenshots would be awesome. Here's some screenshots of Stencil2Eye 02 as Stencil2Eye 01 was mainly just for dingbat fonts. Probably not helpfull for a beginner, but some people might find it useful, I'd write more detail, but wtf? 03. Make a "stencil selection" using the stencil and magic wand. 04. Copy the original image using the stencil selection. 05. "Dip" the selected image in a color. 07. Copy "dipped" image BACK to original. 08. 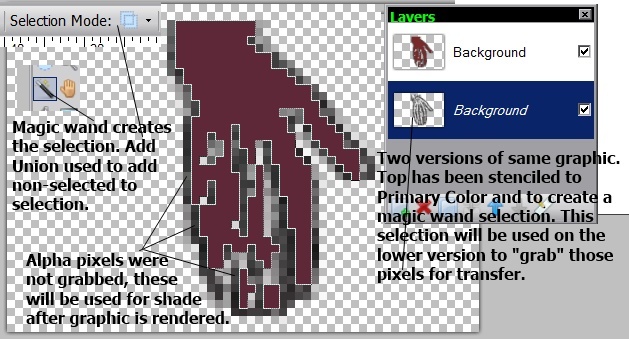 Paste over original so that alpha shadows can be used.